Theresa Bonopartis has published a little gem of a book, A Journey to Healing Through Divine Mercy that will be a perfect companion for your Lenten journey. Like many of the best spiritual writers, her reflections are refreshingly simple, yet profound and rich in practical spiritual wisdom. The book is broken down into small chapters that focus on many of the common core emotional and spiritual issues in the lives of those with abortion loss. Within each section you discover excellent passages from various saints and holy men and women. Excerpts from Sister Faustina’s Diary are featured in each chapter and nicely compliment the author’s own reflections. As I read through Theresa’s book, it struck me that this would have special benefit and blessing for those who suffered traumatic loss and the painful spiritual darkness that can arise from past abandonment, abuse and neglect. Perhaps that is because the author has travelled through some very painful and traumatic experiences on the road to Divine Mercy. Theresa opens the Journal of Healing to share a brief account of her traumatic later term abortion as a teenager. Theresa’s parents threw her out of the house after they learned of the pregnancy and later she is rejected by the baby’s father who pushes her to abort their child. Homeless, impoverished and vulnerable, she gave in to desperation and fear. Theresa touches on the issue of denial that is so powerful for those that participate in the death of their unborn children. Denial is often a necessary part of surviving the shock and confusion of the abortion event. Theresa found peace and healing through a personal encounter with the Divine Mercy of God that touched her in a very deep and intimate way. The grace from that blessed event fills the pages of her book and later inspired Theresa to develop her after-abortion healing program Entering Canaan. A Journey of Healing contains practical spiritual and emotional wisdom that touches on some of the common core issues for those with abortion loss; trust, forgiveness, discouragement and despair, impatience and pride. Theresa acknowledges her own struggles in these areas as she gently encourages and calls those who are afraid to take those small steps in the healing journey. There are some helpful reflections on the challenges, and opportunities that various Holidays such as Mother’s Day and Christmas can present to those with abortion loss. One of the valuable themes repeated in this book are that of patience and perseverance in the spiritual life. While a seemingly simple concept, it is in fact the most challenging aspects of the spiritual journey and an obstacle that leads many to stagnation or even regression in their faith life. Interwoven into A Journey of Healing are Theresa’s experiences of suffering and healing of her abortion loss within the context of her family. This is an important as it touches on the reality that while isolation and shame are common after the procedure, this wound touches many people. Often other family and friends can play a significant part in the abortion decision and are impacted by the symptoms that are common after the procedure. 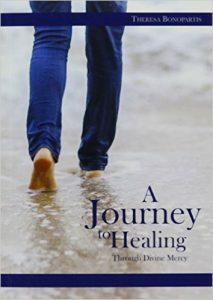 A Journey to Healing has some valuable sections on how Divine Mercy touched all those relationships in Theresa’s life bringing new understanding, reconciliation and peace. She rightly stresses that this requires much prayer, patience and trust in God. Amen! This provides a healthier context to look at our sin, no matter how grievous. It is also a wakeup call that if we remain trapped in our pride, separated from God’s love, mercy and grace – we can all, in different ways, continue to abort God’s will in our lives. A Journey of Healing is certainly appropriate for those with abortion loss that need encouragement to takes steps to a deeper reconciliation and healing in their lives. But it is also an excellent resource for those who have been through an abortion recovery program and want to continue on the road to deeper conversion, healing and growth in the faith. Consider this a valuable resource for your study/prayer group and an excellent book for spiritual directors to accompany those with abortion loss. Take time this Lent to read Theresa’s book. You will find in A Journey to Healing a deeper healing of your abortion loss and a blessed encounter with God’s Divine Mercy. This entry was posted on Monday, February 27th, 2017 at 8:48 pm	and is filed under Uncategorized. You can follow any responses to this entry through the RSS 2.0 feed. You can leave a response, or trackback from your own site.